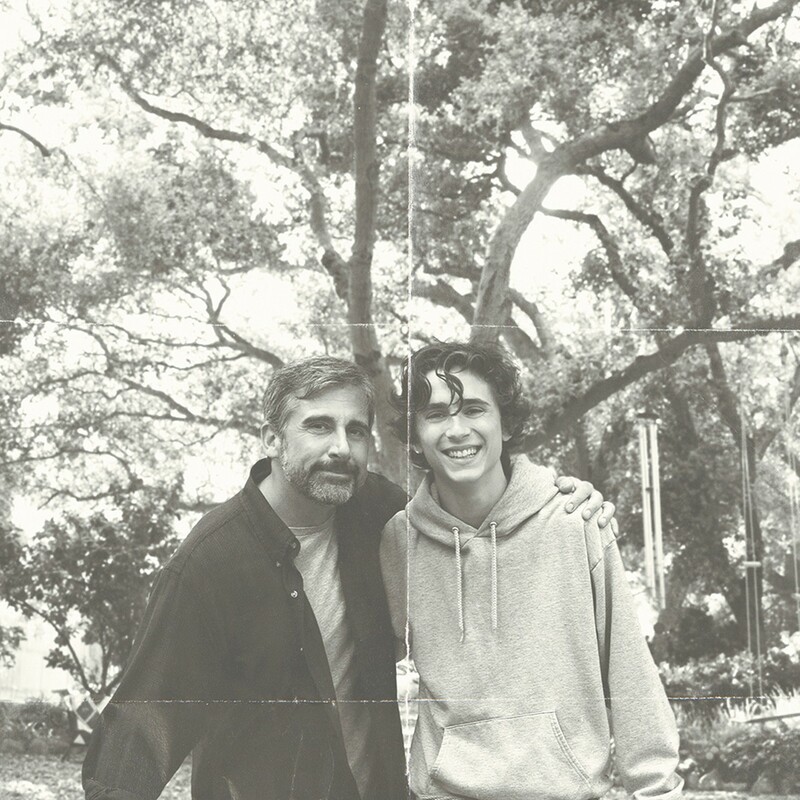 Steve Carell and Timothée Chalamet play father and son David and Nic Sheff in Beautiful Boy. Although it's based on two separate memoirs, one by writer David Sheff and one by his son Nic, there's very little in Beautiful Boy that feels personal or unique. The story of Nic's yearslong struggle with drug addiction and David's increasingly futile efforts to help his son, Beautiful Boy plays out like nearly every other story of drug addiction, with a repetitive sobriety-and-relapse structure that ceases to be illuminating after the second time, and winds up in service of a clunky public service announcement. Stars Steve Carell (as David) and Timothée Chalamet (as Nic) give committed, heartfelt performances, but the movie still makes a muted impact. A progressive journalist and author who lives in a gorgeously appointed home in the Bay Area, David is the kind of person who would probably think of himself as a "cool dad" and seems to have a close relationship with Nic, his son from his first marriage to Vicki (Amy Ryan). But Nic has a secret life that David is oblivious to, at least until Nic disappears for two days and returns home strung out on meth. Thus begins the cycle of David pushing his son into rehab programs that Nic eventually resents, as Nic's addiction progresses from marijuana to meth to heroin, with pills and alcohol on the side. It's all handled sensitively by the cast and by Belgian director and co-writer Felix van Groeningen (the Oscar-nominated The Broken Circle Breakdown), who resists the most obvious awards-baiting moments, even as both Carell and Chalamet emote heavily. Maura Tierney mostly frets in the background as David's wife Karen, mother of his two younger children, but she gets one strong moment when she chases after Nic, as the weight of all the time being the strong silent one comes crashing down on her. More often, though, the movie relies on a hip alt-rock soundtrack to make up for its lack of emotional specificity. The music is also sometimes the only way to work out the timeline, which occasionally shifts back and forth for no productive reason. After a while, it gets tough to tell whether Nic has been an addict for a few months or a few years, and that also makes it hard to gauge how bad things have really gotten for him. Chalamet remains movie-star glamorous no matter how strung out Nic gets, although his anguish still comes across at the most important moments, especially in Nic's tragic relationship with a fellow addict played by the perpetually underrated Kaitlyn Dever. This is more David's story than Nic's, though, and it perhaps lets him off the hook too easily, especially when he's so consumed with giving Nic unwanted help that he neglects his wife and two younger kids (who barely get a handful of lines). The family's enormous privilege also goes mostly unmentioned, although the fact that a kid with all of Nic's advantages still ends up hooked on drugs may be part of the point. The original print version of this article was headlined "Drug of Choice"